The 234th meeting of the NY Comics & Picture-Story Symposium will be held at Parsons School of Design. Robert Andrew Parker on his career and work. Parker will show and discuss his illustration work over the years at Fortune, Sports Illustrated, the New Yorker and countless other magazines. Parker is a legendary American artist, illustrator and printmaker. He has produced set designs for operas and films, illustrations for over 40 children’s books and many magazine illustrations and covers during the course of his career. “Robert Andrew Parker is one of the most accurate and at the same time most unliteral of painters,” the poet Marianne Moore wrote of him. “He combines the mystical and the actual, working both in an abstract and a realistic way.” Born in Norfolk, VA in 1927, he went on to study at the Art Institue of Chicago during the late 1950s. After finishing school, he was recruited to play the role of Vincent van Gogh’s hands in the 1956 MGM film Lust for Life, though his hands never ended up in the finished film, he was able to live lavishly in the South of France during the production. 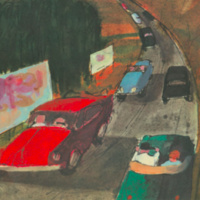 In 1970, the artist began one of his best-known series of works. Based on the World War II-era poems of Keith Douglas, the suite of watercolors portray both the wistful days of a British solider on holiday and the bleak reality of his time fighting in the battlefields of Egypt. His works are in the collections of the Metropolitan Museum of Art in New York, the Los Angeles County Museum of Art, and the Art Institute of Chicago, among others.